Nasi Lemak, a common name in the list of the local food delicacies of Asia. Nasi Lemak, one of the top Malaysian cuisine has its great influence to Singaporean. Many local Chinese, thus, eat and cook this aromatic rice dish, for breakfast, lunch and even dinner. As such, Nasi Lemak is not limited to just the Malay food stalls, it’s commonly sold in Chinese eateries everywhere in Singapore. For the Singaporean Chinese version of Nasi Lemak, it comes with even greater varities of side dish. What makes it different from the traditional Nasi Lemak which wrapped in banana leaf and comes with standard sides e.g. egg and chicken wing or fried tiny Kampung fish, the Chinese Nasi Lemak allows you to pick or choose your favourite side dishes from the pool of selections provided by the stall/ eatery, in general. Any versions, they all taste heaven..
Nasi Lemak, literally translated as “fatty rice”, the fat refers to no more than the fat of coconut milk added into the rice cooking. The aroma yields from the rich coconut milk flavour in the rice, making this Nasi Lemak dish so unique and delicious. Now you know what’s about Nasi Lemak, if you weren’t at first. Here’s the recipe I’ve cooked. Easy and quick. Add all in ingredients in the rice pot to cook in electronic cooker, or steam the rice over stove till cooked. * Sides are optional. The above listed are my personal preference. 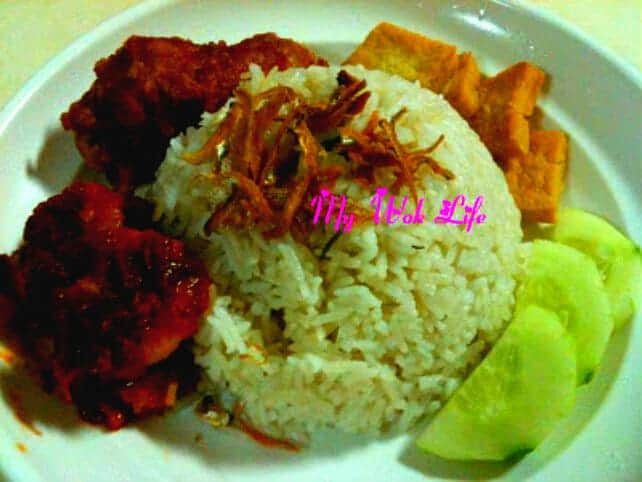 Include all or pick your choice(s) to compliment your Nasi Lemak. Tips: The amount of water to cook the rice should be as usual, if you like softer texture. * In fact, the amount and types of coconut cream/ milk used in Nasi Lemak recipe is pretty versatile. Simply add more coconut cream, if richer flavour preferred. Both the thick paste-like cream or fresh watery coconut milk versions are fine. For later option, the amount should be increased for better aromas, too (up to 500ml = 2 full cups). * Preparation of Kachang can be done by roasting or deep frying the peanut (usually fried with its skin remained intact).